Paris is a flirty city, from its high point around the lacy Sacre Coeur church to the satin ribbon of the Seine which circles its waist like a belt. If cities were people, this one would have lots of frilly petticoats. This is why director Baz Luhrmann's film Moulin Rouge - set in Toulouse-Lautrec's Paris of the late 1890s when the city was at its arty, decadent best - was so appealing. The story centres on the lives of the courtesans and bohemians who frequented the Moulin Rouge (Red Windmill) nightclub, where the can-can dance became famous. 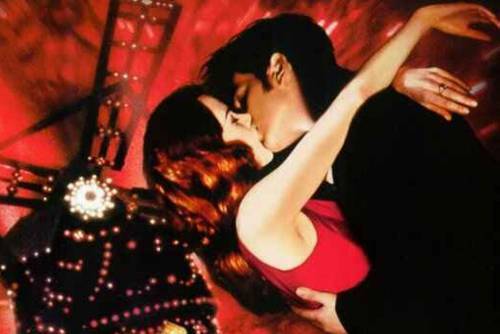 In the late 19th century, Moulin Rouge was to Paris what Studio 54 was to New York in the 1970s - the heart of the hip. The Moulin Rouge still exists, of course, in the Montmartre district of Paris. Today, most of the sequined and feathered dancers are girls from Australia or the north of England, hoping to make money overseas, and the audience foreign businessmen or tour groups. It's not the best destination for luxury lovers in search of an elegant night spot but there is still plenty of red velvet around so you can see what it must have been like in its heyday. For a more authentic fin de siecle atmosphere, head to Au Lapin Agile nightclub (26 Rue des Saules) which has been a Montmartre institution since the early 1900s. When he wasn't at Moulin Rouge, Toulouse-Lautrec hung out here until dawn. These days the club is open from 9pm until 2am. This former Cabaret des Assassins gets its name, "agile rabbit", from a painting you can still see on the wall by humorist Andre Gill. Pablo Picasso painted the club in the early 1900s and portrayed himself as a harlequin. For several years, the painting was kept in the Au Lapin Agile cabaret. In 1912, Frede the owner of the Cabaret, sold the painting for $20. It was finally auctioned in 1989 at Sotheby's New York for over US$40 million dollars. Those looking for 21st-century decadence should try Balajo (9 rue de Lappe). Housed in what was once a music hall frequented by Edith Piaf, it is one of the best clubs for dancing. The young and hip head to Le Folies Pigalle (11, Pl Pigalle) which also has live music; the fashionable and well-heeled to Les Bains (7 Rue du Bourg-l'Abbe), which was once a Turkish bath house, hence the name. For a camp parody of all those high-kicking showgirls, visit Chez Madame Arthur (75 Bis rue des Martyrs). Today the artists in Montmartre's main square, Place du Tertre, are mostly just there to paint pictures for the tourists and the bohemians have been replaced by the souvenir sellers. Nevertheless, the look of the area hasn't changed since the 19th century. It still has the same winding streets leading up the hill (called the butte). You'll find lots of less famous - and less crowded - squares off the tiny winding alleys and there is even Paris's only vineyard with rare green space. Climb up to the church of Sacre Coeur for a view over the whole of Paris. Sitting in the shadow of the church is St Pierre Montmartre, one of the oldest churches in the capital. When you're shopping in the city it's impossible to forget when you see all those chic Parisians that Paris is the home of haute couture. Around Place du Tertre you'll still find restaurants at which those 19th-century artists would have eaten. La Mere Catherine dates back to 1793. The most luxurious restaurant in the area is Beauvilliers (52 Rue Lamarck) and with its heavy gold pattern drapes, lace and flowers it is exactly the kind of place to which courtesans and their lovers would have gone to wine and dine. These days you're more likely to share your escargot with French film stars. Apart from eating and drinking, there is some more traditional sightseeing in Montmartre. The Mussee de Montmartre contains works by many of the artists who lived in the area, including Maurice Utrillo and Amedeo Modigliani. There's also lots of memorabilia of the bohemians, including a reconstruction of Utrillo's favourite café. Le Placard d'Erik Satie is a small museum set up in the tiny studio where he lived and worked for eight years from 1890. He used to call it The Cupboard (le placard). Montmartre was once home to more than 30 windmills, hence the name of the nightclub. Used to grind wheat and press grapes, now only two remain. The better one is Moulin de la Galette on rue Lepic. The steep road to the windmill is a good shopping area with the best market in Montmartre. When you're shopping in the city it's impossible to forget when you see all those chic Parisians that Paris is the home of haute couture. All the designer shops are located on the Right Bank mostly along the ritzy Rue du Faubourge St-Honore. However, for the US premiere of Moulin Rouge Nicole Kidman wore a vintage white beaded slip dress. Her creation reportedly came from one of Paris's upscale vintage stores. Try Reciproque on Rue de la Pompe , a series of seven boutiques selling second-hand designer frocks. Buy a dress of your own, then all you need is a premiere to go to. Rue de Rivoli. Recently refurbished by Phillip Starck. One of the most elegant city addresses. Rue du Faubourg St-Honore. One of Paris's most famous hotels. Incredibly luxurious and decorated with antiques. The king of historic Parisian hotels and still one of the most extravagant.with its Jeff Leatham floral art. One of the Dorchester Collection. Just off the Champs Elysee with bright red awnings and a central courtyard . Place de la Concorde. If you want a great palace hotel this 163-roomer reigns supreme. Rue des Beaux-Arts. This boutique hotel is best known as the last home of Oscar Wilde. There is a domed stairwell, a tree trunk in the dining room and a parrot in a cage. Pompidou Centre - modern art from 1905.